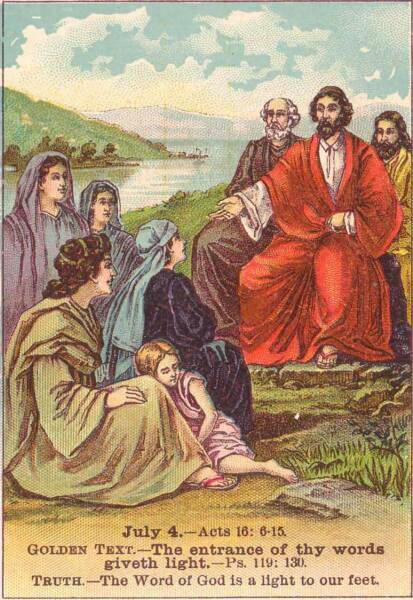 And on the Sabbath day we went outside the gate to a riverside, where we were supposing that there would be a place of prayer; and we sat down and began speaking to the women who had assembled. A woman named Lydia, from the city of Thyatira, a seller of purple fabrics, a worshiper of God, was listening; and the Lord opened her heart to respond to the things spoken by Paul. And when she and her household had been baptized, she urged us, saying, “If you have judged me to be faithful to the Lord, come into my house and stay.” And she prevailed upon us. So this this passage is shown to be of no use to Calvinists, since she already loved God, and was not a totally depraved, totally unable hater of God who rejected and refused God. The text doesn’t say that she was claiming to have been a “worshiper of God,” but rather, the text itself asserts that point as fact. Alleging that she was a false worshiper, as a hater of God, is certainly a leap outside of the text, though that would be needed for Calvinists to be consistent. It wouldn’t be a violation of her free-will if she was already receptive as a “worshiper of God,” and as for why she needed for God to open her heart to respond, the text doesn’t say, and of course, the text also never says that she was forced into anything, but rather enabled. Perhaps all that she needed was a preacher to articulate the gospel in the manner that Paul did, who “spoke in such a manner that a large number of people believed, both of Jews and of Greeks.” (Acts 14:1) After all, Paul was appointed by Jesus as a minister and a witness for this very purpose, that is, to “open their eyes.” (Acts 26:15-18) As for what God does for everyone, John 16:8 indicates that the Holy Spirit convicts the world of its sin. Those who are receptive to the light and welcome God’s grace, tend to receive more light and more grace, and such certainly seems to be the case with Lydia, as a receptive “worshiper of God.” However, Calvinists need to explain why she needed regeneration in her encounter with Paul, if she was already, previously a worshiper of God, which according to Calvinism, would have required a previous regeneration. So are Calvinists forced into teaching progressive regenerations? Lydia had been faithful up to the level of revelation that she received, and now she needed to hear the gospel message about the Messiah. It’s not that the gospel message had previously been ineffective on her, or that she had previously rejected it. For all we know, she may not have even heard the gospel yet until Paul arrived. No one would ask why God only opened one woman’s heart and passed by the rest, since the text never elaborates on any such thing. Question: What does it mean that God “opened” her heart? Calvinists cannot admit that she was previously a believer in God, or else their theology would require a double regeneration, that is, one previous to her encounter with Paul, and again during her encounter with Paul.